Joker from Persona 5 will soon be making his way to Super Smash Bros. Ultimate as a DLC fighter, and Best Buy may have leaked what the leader of the Phantom Thieves of Hearts will look like in the Nintendo Switch exclusive. 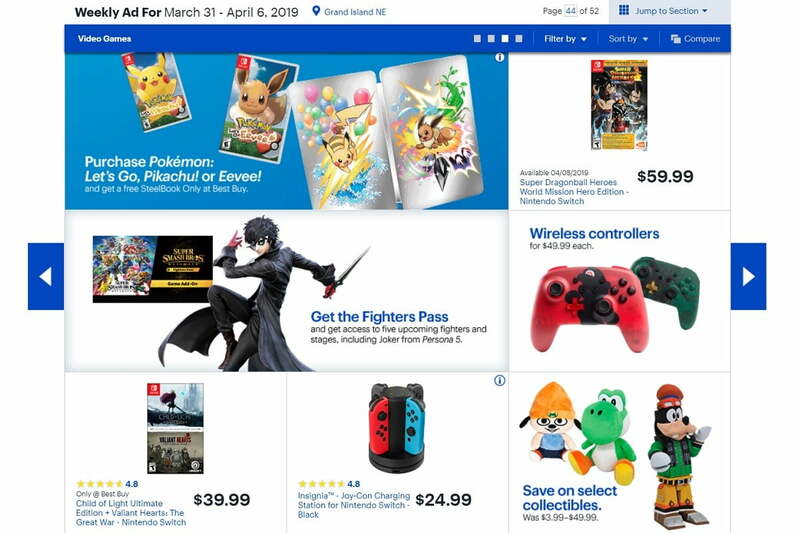 One of the featured items in the Video Games section of the weekly ad of Best Buy for March 31 to April 6 is the Fighters Pass for Super Smash Bros. Ultimate, which will grant players access to five new fighters that will be added to the brawler’s already massive roster. The ad features an image of Joker, which was revealed at The Game Awards 2018 as the first DLC character for the game. Joker’s image on the Best Buy ad, however, has never been seen before, and there is speculation that it may be his render for Super Smash Bros. Ultimate. Joker’s pose in the allegedly leaked image also looks like a possible amiibo pose, so it may be his Nintendo figurine that was revealed. Until now, Nintendo has not revealed gameplay information for Joker. If the leaked image by Best Buy is indeed his render for Super Smash Bros. Ultimate, it would seem that there will be no delay in the character’s expected addition to the game’s roster this April. Another clue on the imminent arrival of Joker in Super Smash Bros. Ultimate was spotted by twitter user SomeKidNick. The change from “Approaching: April” to “Approaching” has some players concerned that Joker’s addition will be pushed back, but the more likely explanation is that Nintendo made the change to avoid redundancy, as April is finally here. A Reddit thread that discusses the change also contains speculation on when in April Joker will arrive to Super Smash Bros. Ultimate. In Persona 5, there are a few significant dates in April in the in-game calendar, including Joker moving in to Cafe LeBlanc on April 9 and awakening his first Persona on April 11. Atlus is also set to reveal more information about the mysterious Persona 5 The Royal on April 24. In other rumors, the remaining four DLC fighters for Super Smash Bros. Ultimate will allegedly be Erdrick from the Dragon Quest series, Ryu Hayabusa from Ninja Gaiden, Steve from Minecraft, and The Marine, also known as Doomguy, from the Doom series.